【Ultra Fast】- Instant read thermometer measures temperature within 3-4seconds. No delay for the best timing of cook! Accurate to +/-1 degrees with a wide range of -58°F ~ 572°F. For maximum measurement accuracy, a calibration function is provided. 【Back Light Design】- With this meat thermometer you can get the temperature clearly at night with the backlight button. It makes barbecue and picnic easier and more convenient in the evening. 【Waterproof】- The digital BBQ thermometer is based on IP67 waterproof standard design. The waterproof thermometer can be washed under running water without fear! The waterproof function makes it perfect for Liquid, Food, Meat, Candy, Deep Frying, Cheese, Chocolate, Coffee, Milk and Bath water temperature. 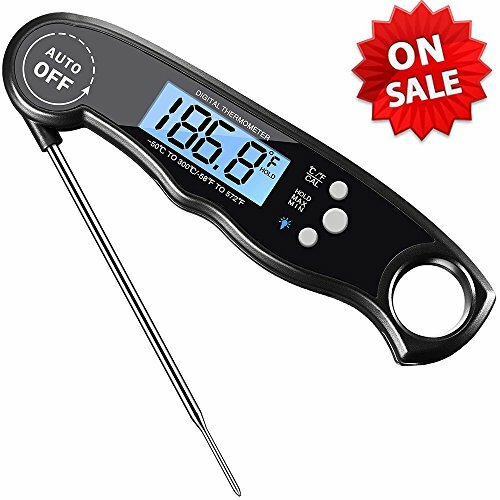 【POWERFUL MAGNETIC FUNCTION】 Kitchen thermometer built in strong magnet. Allow to hang candy thermometers on Refrigerator Door, Barbecue Rack, Cupboard, or any iron surface. Further more, hanging hole is handy for wall hook.